Bradford began carving and painting in 1989, after working in the woods, and as a labourer and house painter. He is well known for his carvings of peacocks, roosters, seagulls, bears and small to life-size human figures, and the red and black checkerboard frames on his paintings. He has also carved mermaids, deer, bobcats and a number of other animals. Bradford Naugler's work includes a commission for the Confederation Gallery in Prince Edward Island, for whom he did life sized carvings of the ten fathers of confederation. He is featured in the 1994 National Film Board production, "Folk Art Found Me", and has also been featured in a number of television shows. His work toured the British Isles as part of the Canadian Cultural Heritage Exhibition (1989) and is included in the collection of the Art Gallery of Nova Scotia and in collections throughout North America and Europe. His six foot carved "Black Bear" was donated to the Canadiana Fund, and is now located at the official residence in Ottawa. Bradford has participated in all of the Nova Scotia Folk Art Society festivals, and the 1992 festival poster featured one of Bradford's well known carved roosters. Bradford's artwork has twice been featured on the poster for the Nova Scotia Folk Art Festival. 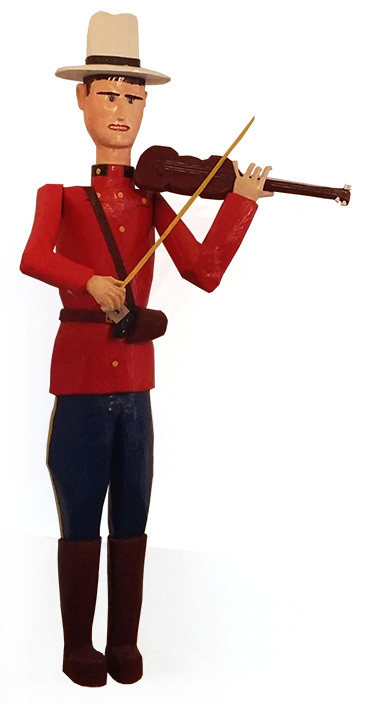 If you are interested in purchasing the Fiddling Mountie in the image it is priced at $3,000 and 20% of the sale price will be donated to Memory Lane Heritage Village. The Mountie is over 6 feet tall. References: Art Gallery of Nova Scotia, Nova Scotia Folk Art - Canada's Cultural Heritage (1989); Nova Scotia Folk Art Society, A Joyous Vision (1995); Art Gallery of Nova Scotia, A Life of Its Own (1997); Blake McKendry, An Illustrated Companion to Canadian Folk Art (1999). Bernard Riordon (Beaverbrook Gallery), Canadian Folk Art from the Collection of Susan A. Murray (2007).